Which Clothing Item or Accessory Do You Keep Buying Over and Over? I just got a new pair of sunglasses. 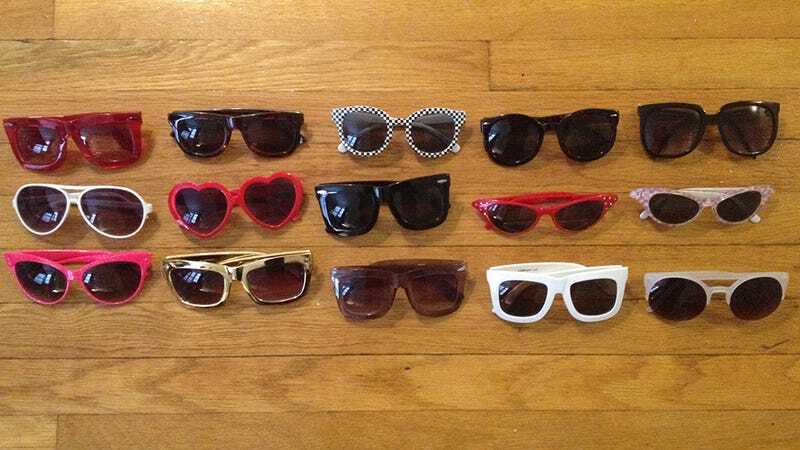 This is in no way noteworthy except that I already have around twenty-six pairs of sunglasses. But don't you have that one thing you just keep buying over and over again? Wardrobe overstock? For some people, it's pairs of jeans. Stacks and stacks of jeans. Or it might be black pants. And I know someone who has what seems like an endless supply of little black skirts. Me? I cannot resist bags and sunglasses. Bags not as much these days, but sunglasses? Always. ALWAYS. I can't get enough. Such a cheap mood booster/outfit updater. I wear them winter, spring, summer, fall. Whenever. Most of mine were purchased for $12 or less, although I do have some expensive ones — a pair by Grey Ant, some Chanel shades I bought like fifteen years ago and a pair of jewel-encrusted Dior ones that are so nice I get scared to let them leave the house. But the point is this: Sometimes we're creatures of habit, and if you're in the habit of accumulating one particular item — boots, undies, rings, SUNGLASSES — I want to know about it. Please spill.